Cash in hand, I owned a 2003 SANTE for 4 years, sold it 5 years ago. Now my kids are old enough to enjoy a boat, so I am in the market for a Python SAN 99-03. I prefer a white black or gray color scheme. However I will consider any other colors. There is one here in Texas for sale in the classifieds. Yes The white and Red one. I am looking for other color combinations. It’s a good looking boat, red just isn’t my top choice. 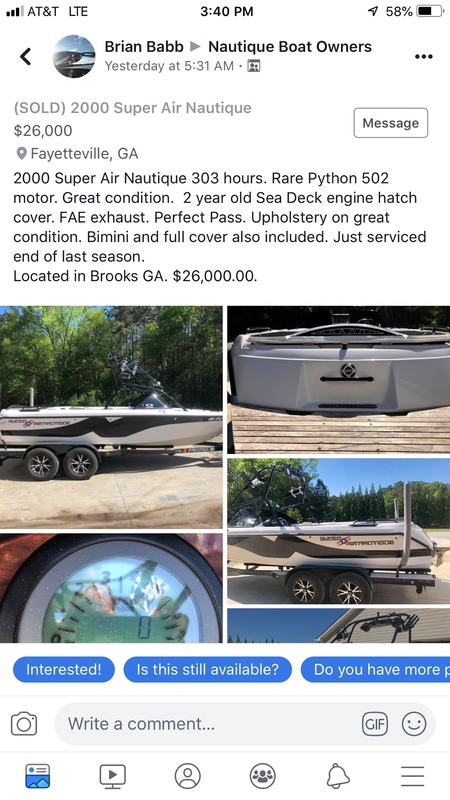 There was one posted on the Nautique Boat Owners FB page yesterday in Georgia. I want to say maybe around the 25k price point. I actually tried to buy that one the last time it was for sale. Good Looking boat. I was a bit skeptical about the sun deck. I would have to see it in person or some closer up pictures. Couldn’t tell if it looked good or not. Same, I wondered how it turned out.